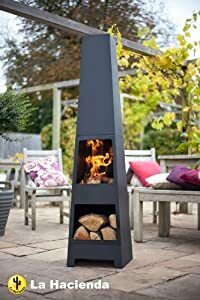 Garden incinerators & Fire Pits are now selling the excellent Free Cover La Hacienda Malmo Steel 150cm Chiminea Chimenea Patio Heater With Wood Store for a great price. Don't miss out - purchase the Free Cover La Hacienda Malmo Steel 150cm Chiminea Chimenea Patio Heater With Wood Store here today! The Malmo Steel Chimenea is a modern stylish looking large Chimenea with a superb log store area included. This contemporary steel chimenea is both stylish and practical. It features a modern, tapered design, a sturdy steel construction and temperature resistant paint. A perfect addition to your garden or patio area.